Everyday you use the bluetooth technology. You can usually tell which device will be able to connect with which one by examining them. It is unlikely that you will be able to connect a mouse to a camera if it is not designed to be controlled by a mouse. On the other hand, it makes sense to be able to connect a headset to a mobile phone, because they are designed to work together. Bluetooth is a wireless technology that allows you to connect two devices to each other. Each Bluetooth equipped device has one or more profiles. These profiles determine the capabilities of the device, for example the hands-free kit (a telephone headset) or the HID interface (computer mouse). For two devices to connect, they must have the same profile. Why the name of Bluetooth ? For the anecdote, the name “Bluetooth” (“blue tooth”) comes from the Danish king nicknamed Harald II Blåtand (“blue tooth”), because he particularly liked blueberries… But he especially managed to bring Denmark and Norway together, as Bluetooth brings together various types of devices. In 1994, Ericsson, a Swedish mobile phone manufacturer, developed Bluetooth technology. The latter simply allows electronic devices to be connected to each other without any wire connection. Bluetooth’s transmission power is relatively low and its throughput limited, as it is used over short distances, in the same house for example. Indeed, Bluetooth is designed to connect devices that are quite close to each other (keyboard and computer, speaker and smartphone, etc. ), even if progress is moving faster and faster, making it possible to connect devices that are further and further away. There are three classes of Bluetooth, allowing data to be transmitted up to 10 metres in range (class III), 20 metres (class II) or 100 metres (class I). Most consumer devices are in Class III. 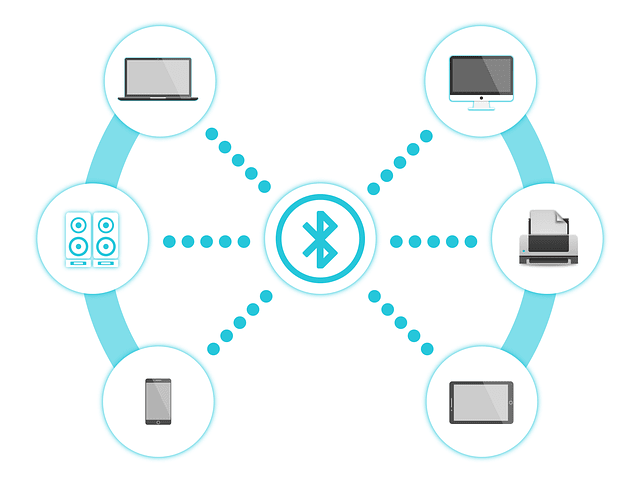 Bluetooth uses radio waves in the 2.4 GHz frequency band (the same as Wifi) to connect equipment to each other (smartphone, speaker, headset, connected objects…) to allow them to exchange data or files (documents, photos, music…). In 2009, Bluetooth 3.0 offered a theoretical throughput of 24 Mbit/s. But it is 2010 that marks an important turning point in the history of Bluetooth with the release of a new standard that is more efficient and less energy-consuming: Bluetooth 4.0. In low-power mode, Bluetooth’s throughput decreases, but this generation of Bluetooth will strongly contribute to the development of connected objects, which do not require very high bandwidth. In 2017, Bluetooth 5 will replace Bluetooth 4.2. This new version of Bluetooth doubles the range of Bluetooth to 200 meters, multiplies the speed of low-power transmissions (4 Mbit/s) by 4, improves interoperability and reduces interference with other wireless technologies such as Wifi. Bluetooth 5 therefore opens up new opportunities for the mobile phone and connected object market. Bluetooth technology has had a significant impact on the mobile phone market, first by allowing two phones to connect to each other without cables to exchange data. The advent of Bluetooth has also made it possible to connect mobile phones that did not have GPS chips to a GPS antenna. And with the development of Bluetooth, many mobile phone accessories have emerged. Your Bluetooth smartphone can now connect to a Bluetooth headset, a Bluetooth kit or directly to your car if it is equipped with Bluetooth, a Bluetooth headset, a Bluetooth device, a Bluetooth device… Thanks to these connected objects, Bluetooth has revolutionized our uses. Bluetooth is also used for commercial purposes: some stores have installed Bluetooth beacons to track your movements and stops in their stores. They can even send you a notification with a targeted promotion or advertisement when you pass by (if you have installed their application on your smartphone and Bluetooth is enabled). Today, all smartphones are equipped with Bluetooth, but to enjoy the benefits of Bluetooth 5, your Bluetooth smartphone and connected devices must use this latest generation standard. Exemple : Speaker, Why choose a Bluetooth speakerphone? Simply to enjoy your music without headphones, in any room of your home or outside, alone or with friends, and with quality sound! While cables remain the most widely used means of communication, Bluetooth technology is gradually eliminating this and making it easier to move devices. No need to search for cable X for port X, while you only have cable Y at home… A wireless connection is extremely convenient and only Bluetooth speakers offer this comfort of use. Indeed, Bluetooth is nowadays the easiest and fastest way to play music wirelessly. To date, the vast majority of mobile devices are equipped with a Bluetooth function.